Spectacular penthouse in Barcelona in the area of Eixample Esquerre. The apartment of 130 m2 can accommodate up to 8 people. 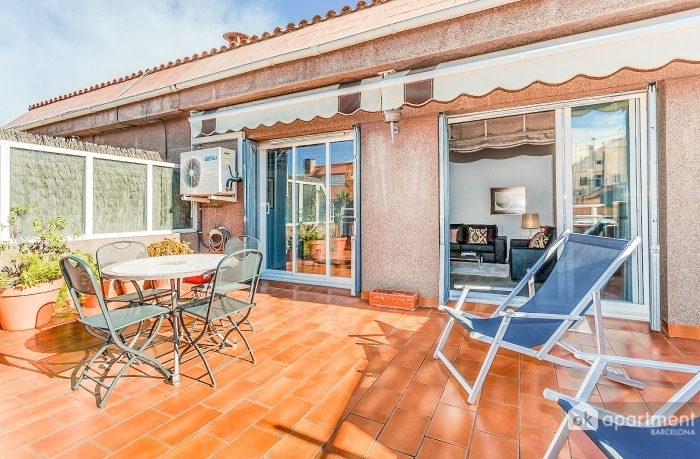 It is composed of 4 double bedroom, independent kitchen very well equipped, living room with dining area, two bathrooms (one is with bath) and spacious terrace with summer furniture. As additional amenities in the apartment there are Internet connection. TV, air conditioning, washing machine. The apartment is located halfway between Plaza Espanya and Plaza Universitat. Close to three different metro lines as well as several bus lines. The sensational location that allows walking to the center of the city. Possibility of parking. Upon receiving the apartment keys you will be asked to pay a deposit of € 4300.